Our team of Foolish contributors thinks these seven stocks are all strong buys right now. With the Dow Jones Industrial Average officially soaring above the 20,000 mark, many investors are wondering if it's now too late to invest. We Fools don't think it is, so we asked a team of our top contributors to share some stocks they think can be safely purchased today. Read on to see why they picked Bristol-Myers Squibb (NYSE:BMY), Archer-Daniels-Midland (NYSE:ADM), Brookfield Property Partners (NASDAQ:BPY), First Solar (NASDAQ:FSLR), Celgene (NASDAQ:CELG), Facebook (NASDAQ:FB), and IBM (NYSE:IBM). George Budwell (Bristol-Myers Squibb): Valuations across the healthcare sector in general, and the pharmaceutical industry in particular, have arguably gotten way out of touch with reality of late. After all, it's become almost commonplace for drug stocks to trade at 10 times next year's estimated revenue haul -- presumably because of the growing belief that Trump's proposed corporate tax reforms will lead to unprecedented levels of consolidation across the pharma industry. With these sky-high valuations in mind, Bristol-Myers Squibb stands out as a complete oddball. The drugmaker's stock, for instance, is now trading at its 52-week lows and at roughly 4 times the company's 2018 projected revenues. Why is Bristol's stock so cheap? My take is that the market is simply overreacting to the news that Opdivo may no longer have the ability to garner a first-line indication in lung cancer after the company decided not to pursue an accelerated approval for its combo therapy that includes the drug. Whether Opdivo breaks into this high-value indication or not, though, Bristol's stock is a downright bargain, in my view. The bottom line is that this drugmaker has a rich pipeline of immuno-oncology drugs, Opdivo isn't going to crash and burn based on its fate in first-line lung cancer, and the company has several other growth products, like blood thinner Eliquis, to create value for shareholders moving forward. That's why I think this big pharma stock is one of the few clear-cut bargains remaining in the high-flying healthcare sector right now. Dan Caplinger (Archer-Daniels-Midland): Dividend investors like stocks that consistently give them more income, and Archer-Daniels-Midland has one of the best dividend track records in its business. The agricultural giant has boosted its quarterly payout every single year for 41 years, and ADM traditionally announces its annual increase when it releases its quarterly results in early February. That makes now a good time to buy the stock in anticipation of higher dividends in the near future. In addition to attractive dividends, Archer-Daniels-Midland also has good fundamental prospects. The stock had taken a hit in 2015 because weak commodities markets weighed on its ability to maximize its profit. However, a rebound in commodities in 2016 has reinvigorated ADM, and the company is looking to return to an aggressive growth trajectory over the coming year. Moreover, efforts to capitalize on changing trends among consumers have given ADM new potential, both to grow its organic business and to make strategic acquisitions to expand its reach. Some have questioned whether Archer-Daniels-Midland might have macroeconomic and geopolitical risk, pointing to the rise in the U.S. dollar and possible trade tensions with traditional U.S. partners as possible obstacles to sustaining and growing exports. However, with a growing world population hungrier than ever, ADM is likely to find long-term success in its core business. Neha Chamaria (Brookfield Property Partners): Brookfield Property Partners' 10% drop in the past six months is just the kind of opportunity you need if you're looking for a well-established growing company with strong prospects and big dividends. Brookfield's fourth-quarter numbers are due in early February, and there's reason to be optimistic. As a real estate company that buys properties and leases them out for long periods of time -- 91% of its property is currently leased for an average term of eight years -- Brookfield is not only able to secure a good chunk of its earnings, it can also command higher rents when it revamps properties. This is something investors need to watch for in Brookfield's upcoming earnings report, especially after the company signed office leases at rents almost 17% higher than that of the expiring leases during its third quarter. Any hint of further rent increases for 2017 should mean stronger cash flows. Brookfield also has some asset sales in the pipeline and fresh leases, like those in Sydney, that should start contributing to its earnings this year. The company looks on track to report strong funds from operations (FFO) numbers for 2016, having grown that metric by 17% during the first nine months of the year. That should also mean higher dividends for investors this year and beyond in line with the company's target of 5% to 8% annual growth in dividends going forward. With Brookfield currently yielding a solid 5% in dividends and trading at just about six times trailing earnings, I think now is a great time to consider this stock. Brian Feroldi (Celgene): With the stock market trading near an all-time high, it's harder than ever to find value. However, the biotechnology sector still hasn't recovered from last year's drubbing, which is why I think Celgene is a great pickup today. Celgene has been a terrific performer over the years thanks in large part to its mega blockbuster blood-cancer drug Revlimid. Sales of this drug grew by 20% last year to $6.9 billion, making it one of the top-selling drugs on the planet. When combined with growing sales of its other hit drugs like Pomalyst/Imnovid and Otezla, Celgene's top line expanded by 22% last year. That's pretty good for a company with a market cap of nearly $90 billion. Looking ahead, I think investors have plenty of reasons to believe the growth will continue. Celgene has plenty of trials under way to expand the labeling for its current product lineup, and it has a pipeline packed full of potential. In fact, management is so confident in its products and pipeline that they have gone on record to predict that sales by 2021 will exceed $21 billion. That's a strong improvement from the $13 billion in sales they're projecting for the year ahead. Despite its growth potential and history of winning, Celgene's stock is only trading for 16 times forward earnings. I think that's a fair price to pay for a terrific business. Tyler Crowe (First Solar): There are two very important facts you need to consider when looking at investing in solar stocks: 1) There is immense opportunity for growth, but 2) it is a viciously competitive and cyclical market. For decades, solar panel manufacturers have reduced costs to the point where utility-scale solar in many places can produce power for less than coal, oil, gas, nuclear, and hydroelectric dams. With wind and solar expected to account for 64% of the 8.6 TerraWatts of new power generation capacity coming online over the next 25 years, there is a lot of room for solar to grow. That being said, many investors who have tried to jump on the solar bandwagon have been burned because they failed to recognize that manufacturing panels is a business that requires lots of capital, is constantly developing or improving technology resulting in a quickly commoditized product, and has to fight tooth and nail for pricing during the ups and downs of the business cycle. To survive these conditions, you need a business that keeps a lean balance sheet and has shown the ability to generate decent returns. In the solar business today, First Solar is the best bet. Its $2 billion in cash on hand is much more than its total debt load, and its returns on invested capital have consistently been the industry's best over the past decade. 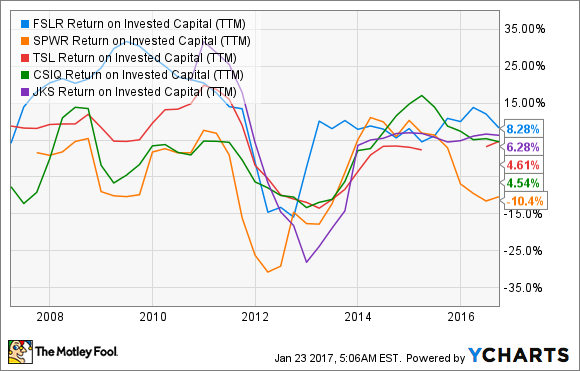 FSLR Return on Invested Capital (TTM) data by YCharts. Thanks to a tough year ahead for solar, the company's stock trades an incredibly cheap price to tangible book value of 0.62 times. If you want to find a time to add solar stocks to your portfolio, then adding First Solar in February is the way to do it. Tim Green (International Business Machines): Shares of IBM have soared over the past year, with investors betting that a return to growth is just around the corner. Big Blue didn't disappoint when it reported its fourth-quarter results in January. While IBM's numbers in 2016 were messy, the company guided for the first annual earnings increase since 2013. It's unclear exactly when revenue will start growing again, but with IBM's strategic imperatives approaching half of total revenue, the turning point shouldn't be too far away. IBM will face tax headwinds this year thanks to some one-time benefits in 2016, but margin improvements are expected to drive earnings growth nonetheless. IBM's cloud business continues to boom, with cloud delivered as-a-service reaching an $8.6 billion annual revenue run rate at the end of 2016, up 61% year over year. The software business has now grown revenue for three consecutive quarters, and a refresh of IBM's line of mainframes could give a boost to the top and bottom lines later in the year. 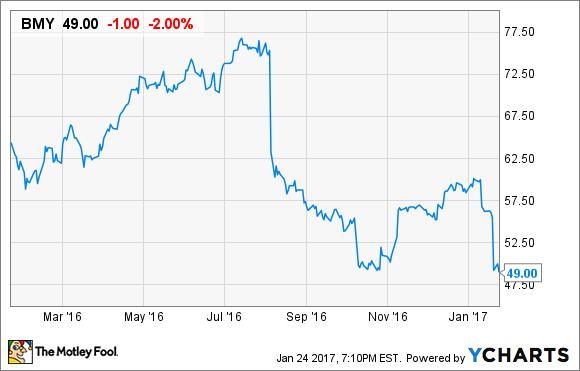 With the stock still trading at less than 13 times earnings guidance, it's not too late to invest in IBM's comeback. Evan Niu, CFA (Facebook): It's pretty hard to argue with Facebook's execution over the past couple of years. The company has enjoyed incredible momentum across the board in nearly all of its expanding portfolio of brands and services, as well as all of the pertinent operating metrics within each of those segments. Instagram now has nearly twice as many users than its rival smaller social network. WhatsApp hit 1 billion monthly active users just about a year ago, which is the critical threshold when it would start thinking seriously about monetization. Oculus remains the leader in the nascent virtual reality (VR) space, and Facebook just recently announced that it tapped Silicon Valley veteran Hugo Barra to lead its VR efforts. All the while, sales continue to soar, jumping 56% in the third quarter to $7 billion. The business is starting to scale, too, with net income skyrocketing 166%, far outpacing top-line growth. Speaking of third-quarter results, I strongly believe the market was being myopic when shares fell on concerns about increased investment, but the last time this happened, in 2014, it proved to be a buying opportunity, and shares put up a strong recovery shortly thereafter. Since the beginning of 2017, Facebook has already started its recovery; shares have regained the losses from November and December of last year and are flirting with all-time highs as we speak. I think 2017 will be a successful year that will see Facebook only accelerate its momentum, and it's better to get in early -- while you still can.